About halfway through reading Joe Sharkey’s new book, Akenside Syndrome: Scratching the Surface of Geordie Identity, I came to a sudden, albeit not particularly shocking, conclusion: I’m suffering from mild Akenside Syndrome. What is Akenside Syndrome you ask? According to Sharkey, it’s a condition that people suffer causing them to feel an ambivalence towards Newcastle or Tyneside despite feeling a strong emotional bond with the area. Being half Welsh (which brings with it its own somewhat negative connotations), perhaps it’s not too surprising that I’m succumbing to feelings of ambivalence toward the city. Personally, I blame Geordie Shore and “Booze Britain” in general for this feeling. Sharkey goes much deeper. As a book, Akenside Syndrome is truly fascinating. An intelligent examination of what forms Geordie identity and why feelings of ambivalence and resentment towards the area occur, the book is far from being a cruel jibe at negative stereotypes or a completely academic, dry anthropological tome. Instead, Sharkey sits delicately somewhere in the middle. Akenside Syndrome doesn’t glorify Geordie culture by any means but instead looks to examine the issues in a measured sense, often contextualising concepts on a national and occasionally international level. It never pokes fun at Geordies but never puts them on a pedestal either, despite Sharkey’s obvious affinity with his hometown. We are introduced to the Four Pillars of Geordie Identity – class, accent, drink and football -before being slowly and carefully being taken through how each of these elements could contribute to the appearance of Akenside Syndrome. The second section, Group Therapy, includes sections of exclusive interviews with a variety of Newcastle natives, including Tim Healy, Val McLane, Sir John Hall, Chris and Simon Donald of Viz Magazine, Narinder Kaur, playwright Michael Chaplin and opera singer Graeme Danby. All of them are at high risk from suffering with Akenside Syndrome, making their testimonies fascinating. The most fascinating section, and also the longest in the book, A Portrait of the Artist as a Young Geordie: Should I Stay or Should I Go? Perhaps unsurprisingly given its appropriation of both James Joyce and The Clash in its title, the section focuses exclusively on Geordie writers, actors and musicians. Being someone who has often mused over why many musicians from the area seem reluctant to say they’re from Tyneside, the chapter is illuminating. In terms of style, the book never becomes dry or overly academic but neither does it patronise its audience. It assumes that the reader has some knowledge of its extensive wealth of reference points, which ranges from pop culture to more anthropological texts. Sharkey also has the sense to pepper the text with anecdotes that engage the reader but also demonstrate his personal connection to the book. Instead of sounding like an aloof outsider, Sharkey is clearly dedicated to his work and is emotionally invested in it. I was lucky enough to be able to ask Sharkey a few questions about the book and Geordie identity in general. 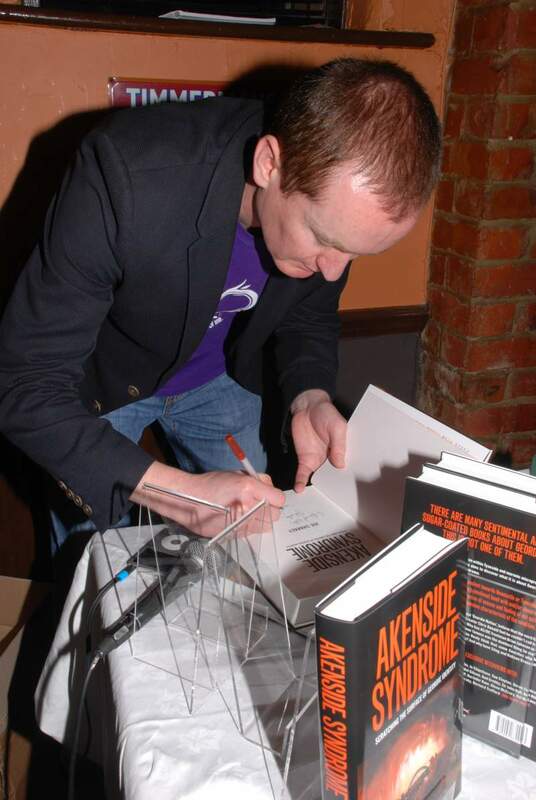 What inspired you to write Akenside Syndrome? In the preface I recall an incident on a flight from Newcastle to London during which a well-known Geordie I was sitting behind said he hated Newcastle. That was the catalyst for me to start researching why so many people from the North-East who leave end up having a love-hate relationship with the area. Not just famous people but your average Joe like me as well. I felt people who had experienced Akenside Syndrome might find it interesting and possibly therapeutic. Another factor was fighting against corrosive stereotypes about Geordies and North-Easterners generally that perhaps hold us back a bit. Alan Shearer would not be so revered on Tyneside if he’d been a world class ballet dancer rather than a world-class footballer! You originally had an alternative subtitle for the book – “or, why Robson Green has a curious accent and Sting lives in Wiltshire.” What happened to that subtitle? It was pretty funny! I loved that subtitle! It succinctly summarised some of the book’s major themes in a tongue-in-cheek way. My solicitor said she didn’t think there was a problem with it legally but as publication drew nearer I had to make a decision. Ultimately I felt that it may be interpreted as me trying to sell my book using Sting and Robson Green’s names and I wasn’t comfortable with that. The book contains exclusive interviews with famous Geordies such as Tim Healy and Val McLane. How did you find working with these famous Geordies who are all, as you say, at high risk of developing Akenside Syndrome? Saying I worked with them would be pushing it a bit! Details of the book’s themes were always sent in advance and most of the famous interviewees willingly engaged with the subject matter. People who’ve made their mark tend to be unafraid of speaking their minds and Sir John Hall, Chris Donald of Viz and Tim Healy were interesting characters to speak to. You have to go in and treat them as you would any other person, which is exactly what I did. You look at a wide range of famous people in the book but I wondered if some professions made you more susceptible to Akenside Syndrome. I can imagine sportsmen being less vulnerable (since as you say, football is one of the Four Pillars of Newcastle) but I would think actors and musicians would be more vulnerable. Did you go in with similar thoughts and come out with different conclusions on this? Lee Hall is mentioned throughout the book and the sport versus the arts dynamic is touched on in his most well-known piece of work – Billy Elliot. Hall has said he got into the arts because he hated the competition of sport, and also that when he was growing up in Newcastle the notion of reading made you a ‘puff’ rather than a swot. Only last year he talked of people being bullied when he was at school for playing musical instruments. So yes people in the arts are far more likely to experience Akenside Syndrome than sportsmen, and to be honest I was expecting that. Alan Shearer would not be so revered on Tyneside if he’d been a world class ballet dancer rather than a world-class footballer! Sir John Hall provides an interview in the book. He famously coined the term ‘Geordie Nation.’ What do you personally think about this term and do you consider yourself to be part of the Geordie Nation? It’s a good sound-bite and he told me that that’s exactly why he coined it – to use as a brand or unifying slogan for Newcastle United. But he’s also a passionate advocate of the North-East and the term has broader geopolitical implications. The problem is that a lot of people in the North-East beyond the confines of Tyneside don’t like being labelled as Geordies, which I understand. Nobody truly knows where the term Geordie originated from in the first place, but inasmuch as the Geordie Nation can be said to exist I am definitely a part of it, especially emotionally. On a more general note, were there any specific challenges you faced when writing the book? On a professional level getting enough Geordies to participate in the research was very challenging. Because there’s an element of critique I think a lot of people were wary. In the North-East we’re great at shouting about our positives but perhaps not so comfortable with introspection, which can be beneficial and liberating. Those who did take part were brave and I respect them for that, regardless of whether or not I agree with some of their views. On a personal level I lost my dad, my son and my wife during the course of researching and writing Akenside Syndrome. No words are needed. You point out in the book that in the late 70s when Sting first joined The Police he had a kind of violent backlash against the fact he was a Geordie and practically disowned Newcastle as his hometown. Now he’s launched his musical The Last Ship on Broadway which kind of glorifies shipbuilding on the Tyne. I’ve seen him around a lot at the moment talking about how much he loves the city and that it’ll always be his home where he grew up with fond memories. So is Sting recovering from Akenside Syndrome? Sting is at a particular point of his Akenside arc, which he attempted to make linear in his early days. He’s now changing the trajectory of HMS Gordon and closing the circle, as several observers have noted. I interviewed playwright Michael Chaplin and he talked of “the old cliché about you spend the first forty years of your life trying to get away from what you were and what you’ve been and all the rest of it. And then you spend the next forty years trying to get back to it… that is a very archetypal thing.” Akenside Syndrome often manifests itself through artistic output, and I see The Last Ship as being almost like therapy for Sting’s ambivalence towards his hometown. A kind of unconscious atonement perhaps. 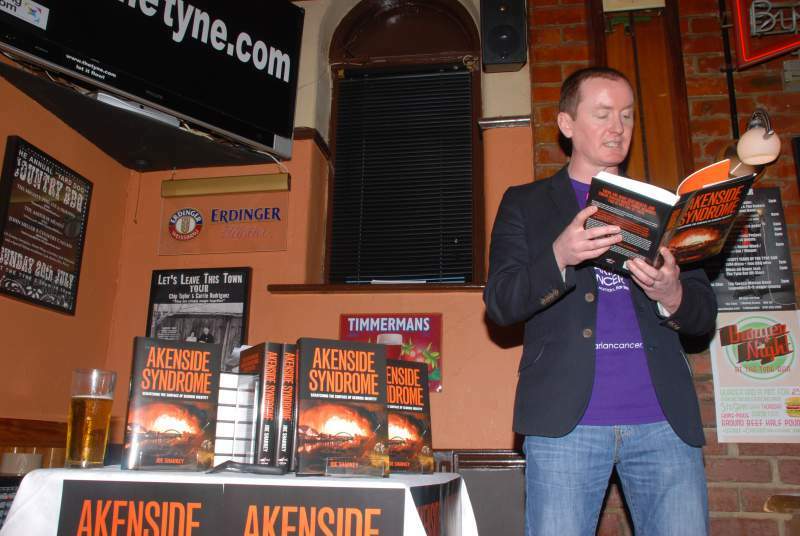 Akenside Syndrome: Scratching the Surface of Geordie Identity is out now.